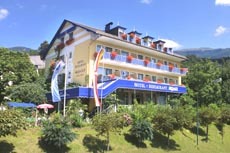 The hotel with a very special brand of flair, on the shores of Carinthia's Millstättersee. A family establishment bedecked with flowers, offering a stylish, bright and elegant ambiance in the spa town of Millstatt, a community marked by its southern flair and healthful climate. Our romantic guest gardens and the babbling fountain soon have you forgetting the passage of time. Enjoy whiling away the hours on our vine-flanked terraces and allow us to pamper you with an array of culinary delights. Romantic lakeshore beach - for the exclusive use of our guests - with sun recliners, boats, surfboards and canoes. Guided mountain hikes, a children's playhouse and lawns to run around on. Located in the "Nikolasch-Stöckl" are affordable, very well equipped holiday apartments - available all year round. The hotel has 55 beds, elevator to all floors, all rooms equipped with bath or shower, WC, hair drier, central heating, self-dial phone, internet hook-up, radio, satellite TV, room safe, balcony with lake view, or w/o balcony but with views of the hills. It's our personal pleasure to cater to your every wish!